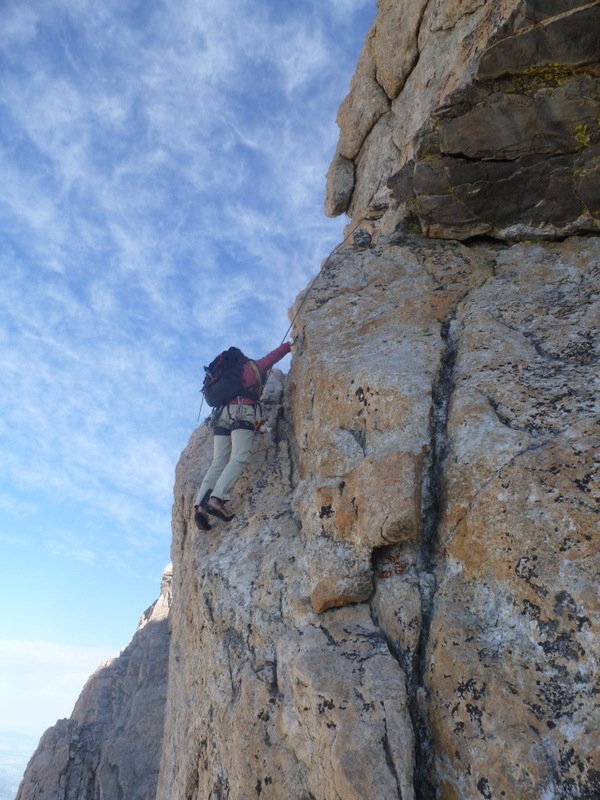 After having missed entirely last time, I returned with Keith to climb the Petzoldt Ridge, a moderate route on the Grand with a distinctive window. We carried a minimal rack, and wore approach (Keith) or running shoes (me) the entire time. Another party from the ranch, Chance and John, had set up camp the night before to climb the same route, and we hoped to catch them along the way. 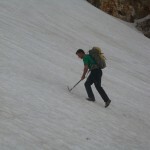 Warm temperatures had melted a lot of snow up high, making it possible to take the summer trail up from the meadows. 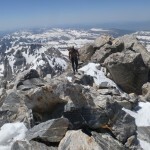 We almost got away without crampons, but had to use them for a short stretch of steep snow between the summer trail and the moraine between the Middle and Grand Tetons. 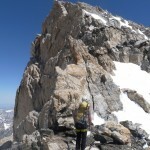 The climb to the Lower Saddle was still snow-covered, but had a deep enough boot-pack to make crampons unnecessary. 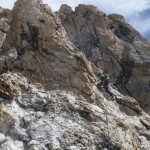 We spotted the other party on our way to the saddle, and caught them as they finished the first pitch of ridge. 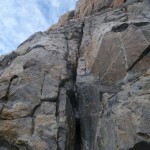 This pitch follows a crack system along moderate black rock before climbing through a white band via an awkward chimney, the crux of the route. Keith led it cautiously, and though I didn’t fall, I was glad to be following. 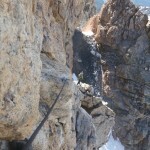 I took P2, around an exposed corner with a large angle piton and up the west face to a ledge with two large blocks. The move around the corner was somewhat awkward, but not especially difficult, and I even managed to find a stance to take a picture back around the corner. Keith led P3, consisting mostly of moderate climbing on golden rock with big holds, to the base of the distinctive window. I led P4 over the window, then up the ridge to a large platform before the knife-edge section. There are few opportunities for protection on this pitch, but I was able to find some cracks and sling a couple larger knobs, and the climbing was mostly a safe romp up big holds. 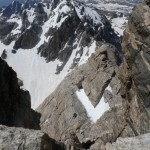 The next two pitches, a knife-edge and a ramp on the left side of the ridge, consisted mostly of similar rock. We had a bit of contention as both parties tried to lead the last pitch together, but there was enough room for us to find separate paths. 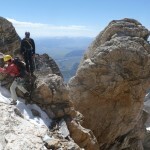 The Petzoldt ridge ends at a knob partway up the peak, requiring a rappel or downclimb to reach the face. It is important to rappel to the east, as the west side is an overhanging cliff over an abyss that would leave you dangling. We packed up our gear at the base of the rappel, then soloed easy 5th class terrain up and left to the Upper Exum ridge, joining it just below the Wind Tunnel. 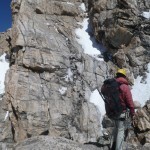 The unpleasantly soft snow encouraged us to stay closer to the ridge-line, and as a result, Keith discovered the elusive “V Pitch,” which I had missed on my previous 3 visits to this route. The scrambling along the ridge to this pitch, and the pitch itself, are some of the best on the route, certainly preferable to a slog up the edge of the southeast snowfield. On the summit, we enjoyed amazingly warm and calm conditions, utterly unlike a year ago. Backtracking slightly to the descent route, we again saw Chance and John on the ridge, but left after waiting for a few minutes. 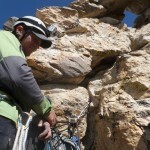 On the way down, Keith showed me a 4th/5.easy downclimb to the right of the annoying upper rappel, saving us some time. The upper part of the descent from the Upper Saddle was covered in miserable slush, difficult to glissade or plunge-step, but we picked up the pace on the lower part. The two glissades to the meadows were still in (barely), and by making every effort at speed, we reached Lupine Meadows in 3 hours from the summit for an 11-hour car-to-car day. 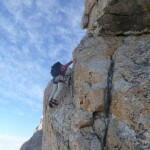 The Petzoldt ridge seemed easier to me than the Direct Exum, with only the crux awkward crack being truly difficult. 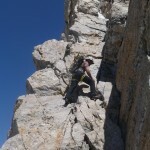 However, it is an extremely fun route, with steep climbing on clean rock with good holds and (mostly) good protection. Don’t rap off the right side!